William Furey was born in Ireland in 1846. He joined the British Army, came to Canada in the 1860's, then enlisted in the North West Mounted Police in 1867. The NWMP was formed to keep order in the west as it "opened up" and protect the Canada/ US border. As whites were moving into the American west in the last half of the 1800's, America considered it their 'manifest destiny' to occupy the whole of North America. The NWMP post at Fort Walsh, NWT, (situated near the US border in what is now S. Saskatchewan) was all that prevented the eventual take-over of the Canadian west by United States during this time, according to some historians. 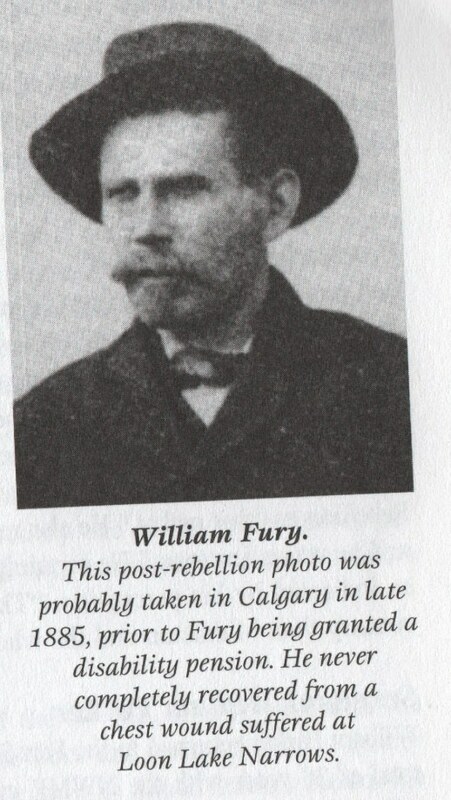 William Fury was among the first recruits to the new force, the NWMP. He was posted to Fort Walsh in 1879 and in 1882 promoted to corporal and then sergeant later that year. He had an exciting few years in the west, at a time of great change on the prairies. He was second in command to the legendary Inspector Sam Steele, head of the NWMP. The new railway and telegraph being strung across the country, American whiskey traders coming across the border to sell their wares to the Indians at the infamous Fort Whoop-Up, and the decline of the buffalo and beaver which destroyed the Indian's way of life - all these factors contributed to the transformation of the prairies. In addition, in the 1870's surveyors turned up in Manitoba to lay out farm lots for anticipated white settlers, taking little account of the Metis already living there. In 1885 they rose up in protest, led by Louis Riel and Gabriel Dumont, and the unrest spread to the rest of the prairies. William Fury was there when all these events happened. In 1884 he was posted from Fort Walsh to the Calgary district where huge commercial cattle ranches had replaced the buffalo. The Indians were starving because the buffalo were gone and it was not uncommon for them to steal livestock. Although only 5'8" tall, William Fury was aptly named - in Captain Steele’s words- , a "determined bulldog little man". In one case, he rode into a Blackfoot camp and single-handedly arrested an Indian for cattle thieving, despite being surrounded by a mob of 100 angry Indians. From there he went to Beaver Creek B.C. in the mountains where the Canadian Pacific Railway was being constructed. . A NWMP detachment was established because CP Rail had run out of money and the unpaid crews were rioting. Inspector Steele was sick in bed with Rocky Mountain spotted fever and Sergeant Major Fury was in charge. He quelled the mob with drawn pistols, and the rioters dispersed, allowing work to continue on laying the rail bed. The Frog Lake Massacre and Big Bear's attack on Fort Pitt in what was later Saskatchewan took place in 1885, two of the actions of the Riel Rebellion. Troops were summoned from the east by telegraph. They arrived in only a few days, thanks to the new rail track. 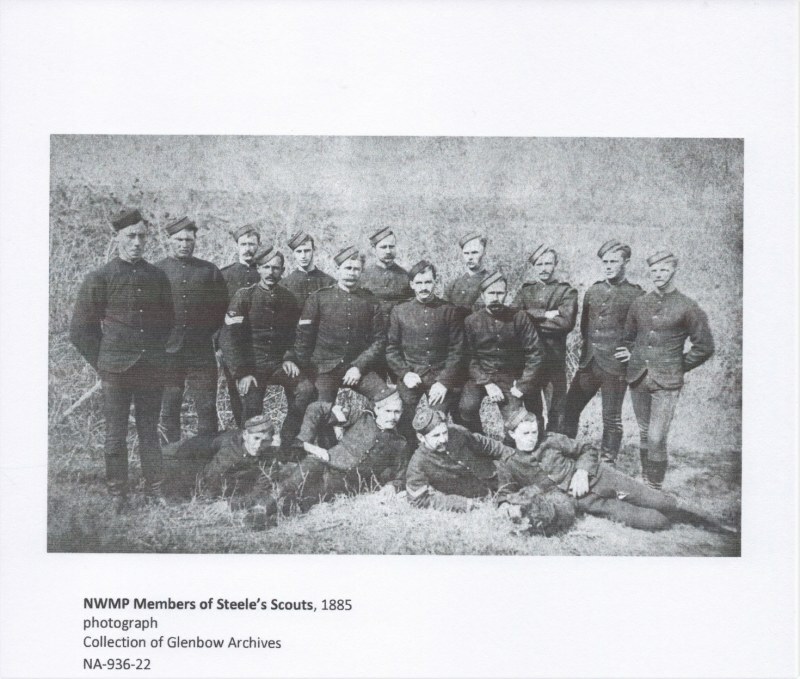 A mounted reconnaissance force made up of 60 volunteers and NWMP was formed to supplement the troops. It was known as Steele’s Scouts, and was under the command of Sergeant Fury. They were to provide their own horse, saddlery and weapons and received between $2.00 and $2.50/day in pay. Sergeant Fury and his Steels Scouts led the soldiers after Big Bear. In a charge up a hill, he was wounded in the chest by sniper fire and had to endure a bone jarring wagon ride to Battleford for medical care. He never fully recovered from his wound. He left the force and was given a pension of 60 cents per diem, the first person to receive a pension from the NWMP. (In 1932, 4 years before he died, the Canadian government belatedly granted $300 to all veterans of the Northwest Rebellion, including Fury). Fury retired to a small farm near Richmond Hill, and married Margaret Thompson of Killean in 1891. He would have been about 45 years old, and she 38. There were no children. I was not able to find out how an ex-soldier from Richmond Hill would meet a girl from Killean, Puslinch. They were still living in Richmond Hill in 1911, and he died there in 1936 at the age of about 90. He was buried here in Killean cemetery, where Margaret's family had pioneered. His funeral was quiet, but the small cortege was escorted from Richmond Hill by red-coated RCMP on motorcycles. Margaret died in 1939. Here in Killean, lies a part of the history of the opening of the Canadian West.